Funding for the project known as the DeWitt property is already secured in the form of a $500,000 grant from the California River Parkways Program, a $125,000 grant from Laguna’s open space fund and a $5,000 award from the Foundation for Sustainability and Innovation. The city purchased the De Witt property off Laguna Canyon Road in 1990 for $2 million with a grant obtained through Proposition 70, the California Wildlife, Coastal, and Park Land Conservation Act, according to city records. The parcel extends from the south side of Anneliese’s School to Phillips Road, north of the Sun Valley neighborhood. In February 2016, Laguna Canyon Foundation signed a $1 a year lease for the ranch house and began making plans for restoration and renovation. The deal gave the 27-year-old organization a home within the wilderness park it is dedicated to preserving. 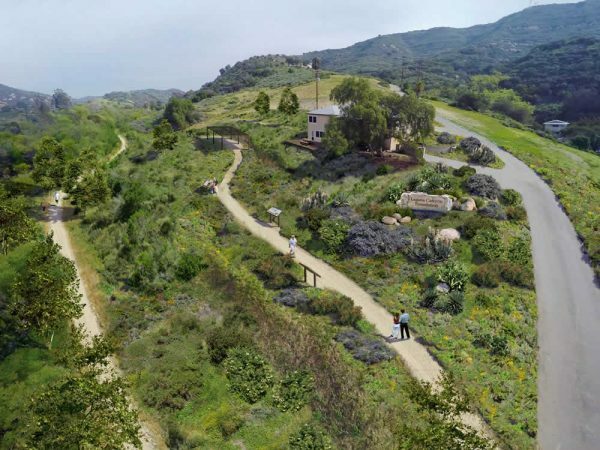 An architectural rendering shows the planned native plant garden and interpretive trails around new headquarters of Laguna Canyon Foundation. At a City Council meeting Tuesday, Sept. 26, Hallie Jones, the foundation’s director, along with David Shissler, Laguna’s director of water quality, laid out their proposal for a three-year project to rehabilitate five acres along one of the few soft-bottomed portions of Laguna Creek. The first step will be to remove an old asphalt parking lot and other debris from the site. The next steps include restoring the natural habitat in the creek channel, removing invasive plant species, creating a nature trail and wildflower meadow and installing five interpretive signs. The foundation works with state, county and city organizations to manage and preserve the 22,000-acre Laguna Coast Wilderness, which includes the DeWitt property. Over the years, its supporters have raised funds and acquired land for preservation, restored wildlife habitats, and maintained and improved the 70-mile trail system between the Coast Wilderness Park and Aliso and Wood Canyons Park. In addition they provide free interpretive programs and standards-based nature programs for schoolchildren in grades two through five, according to their website. Though Jones said the foundation did not intend “to bring a lot of people into the five acre site,” two speakers at the public hearing voiced concerns over parking and conflicting interests in the area. Resident Louis Longhi, whose 28-unit artist work/live compound in Laguna Canyon recently received approval a second time from the California Coastal Commission, said the foundation “is creating another attraction,” which will tax existing parking lots and possibly prompt unsafe pedestrian crossings on Laguna Canyon Road. Jackie Gallagher cited proposed road improvements in State Route 133 as a conflict to the De Witt rehabilitation project. The Caltrans project aims to reduce collisions at Laguna Canyon Road and El Toro Road by reworking the t-intersection. In response, Jones said she recognized the potential conflict and had already met with city engineer Christina Templeton and public works director Shohreh Dupuis. She acknowledged, “overlaps on one specific area at the top of the project,” but pointed out that the Caltrans construction is not expected to begin until 2021 with completion slated for 2023. While the mayor and one other council member questioned if further discussion of the Caltrans project was needed, council member Rob Zur Schmiede lacked similar reservations. He cited confidence in the quality of previous LCF projects and believed coordination with Caltrans would be resolved. Council members unanimously approved a sole-source contract with LCF to build and maintain the habitat restoration project. Jones noted that foundation staff will be on site to oversee the project in perpetuity.